Interior designer Henry Brown doesn’t typically go looking for trouble, but it’s easy to imagine him nyah-nyah-nyahing the heavens as he braces for another rainy day in Portland. The dove-gray palette he chose for his home’s interior, at least, seems a direct challenge to the Pacific Northwest’s notorious gray skies. (What? No sunny yellow walls? Not a trace of ersatz sunshine even in the accessories?) 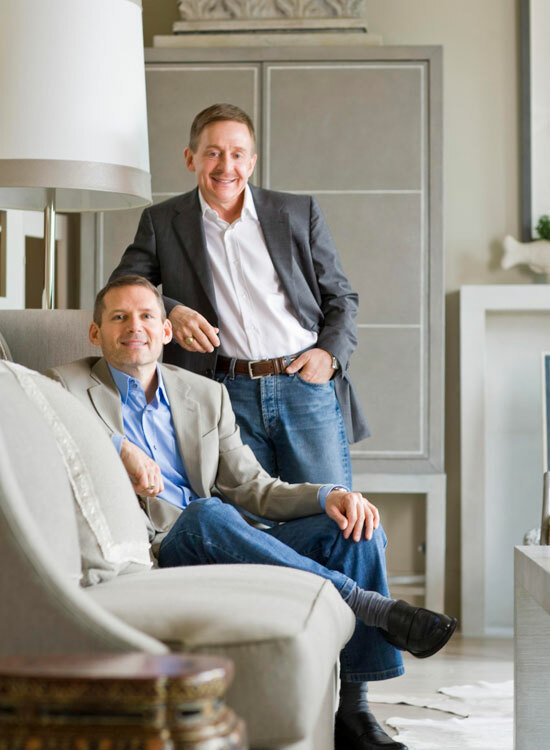 Henry, instead, is confident that he and partner Steve Bedford finally have found a home in which they can weather the intractable overcast with the calm colors they love. As Henry and Steve well know. Their previous residence, 10 years older and twice as large as their current home, also was designed by Jones. “When we decided to downsize, we wanted another Halsey house, and this one was just around the block. Even though it’s small, it lives large, thanks to Halsey’s incredible understanding of space and what it takes to live luxuriously,” affirms Steve, co-owner of the couple’s popular upscale home and garden shop, Bedford Brown. But even seminal designs grow dated. Before moving in, Henry knocked out walls dividing the living room and den, and he relocated the powder room that had separated those spaces to a more private area off the foyer. The result is a plan that lives even larger than Jones’s original airy design. Now, only a grand piano separates the two discrete conversation areas that Henry created on the first floor, leaving the eye free to roam the entirety of the long southern-exposed space. Another dramatic change is the open grillwork that Henry invented to separate the living room from the step-up dining room behind it. The wall articulates the division of spaces without sacrificing a single ray of coveted southern light. After toying with the thought of a flat grillwork screen that would rise halfway to the ceiling, Henry realized that a better solution would be to extend the grid all the way up. Plus, he determined that the grille should be broken up instead of flat, with sections converging at jaunty angles for more interest. “The geometric grid needed this angled design to add dimension to the room,” he explains. Thanks to the home’s southern exposure, Henry was able to decorate for the first time with a palette of cool neutrals—mainly eggshell, pale honey, and gray. The clean colors ensure that collections of overscale architectural salvage and paintings by Northwest artists pop. Dimming down the backdrops included replacing the previously carpeted floors with whitewashed oak, then topping them with gray-white cowhide rugs for toe-teasing texture. Dove gray dominates the drapery and upholstery fabrics. 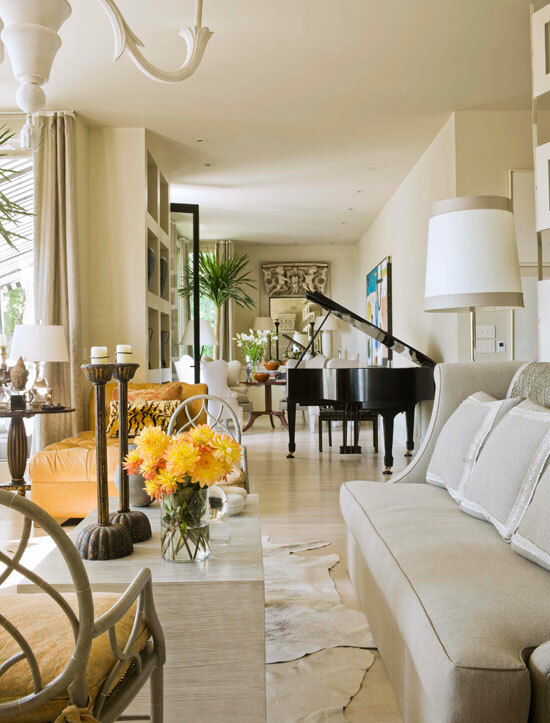 The strongest living room color, in fact, is honey—a dollop on a chair cushion’s Fortuny fabric, and a richer dose on a leather chaise longue. “Warmer colors, which I’ve been forced to use in all my other homes, would have made this house too warm,” confides Henry. Besides showcasing the collections, the pale palette serves a more personal purpose: “As the owners of a design shop, we work with color all day long. It’s nice to go home and have that quiet, Zen-like palette to unwind in,” says Steve. 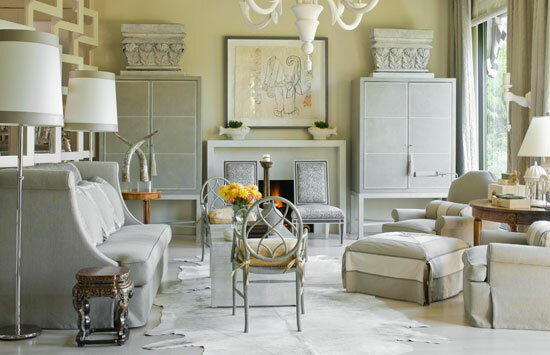 Not only neutrals but a paucity of pattern imbues the spaces with an uncommon serenity. And those few patterns that are present are hushed, never cacophonous. The scale of the animal print on the living room’s fireside chairs is so small that the fabric appears to be a pattern-free solid when viewed just a room away, and the shagreen paper on the custom cabinets flanking the fireplace is more about texture than pattern. Even in the most graphic space—a small den that doubles as a guest room—pattern emanates organically from animal patterns and single-color curtain panels intersticed, like a stone on the Oregon beach, with veins of white. Architect (original): Halsey Jones (deceased). 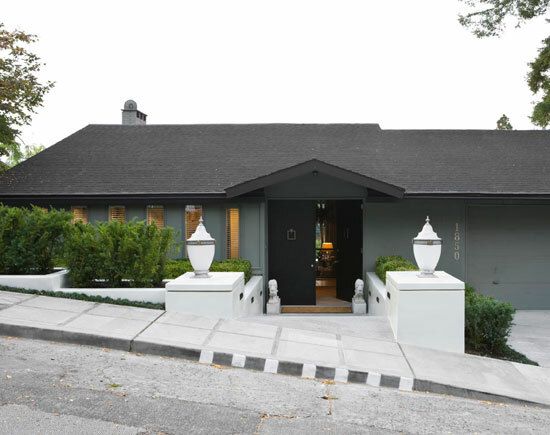 Architect (remodel): Hilary Mackenzie, Mackenzie Architecture, 2827 N.E. Martin Luther King Jr. Blvd., Portland, OR 97212; 503/282-4035, mackenziearchitecture.com. Interior design: Henry Brown, Henry Brown Interiors, 1825 N.W. Vaughn, Suite A, Portland, OR 97209; 503/274-0966. Retail store: Bedford Brown, 1825 N.W. Vaughn St., Portland, OR 97209; 503/227-7755, bedfordbrown.com. Landscape design (original): Wallace K. Huntington, Huntington & Kiest, 2892 N.W. Upshur St., Portland, OR 97210; 503/222-3383. Builder: Jon Lee Contracting & Construction, 1640 S. Carriage Way, West Linn, OR 97068; 503/679-1999, jonlee.cc. Sofa (custom): MCF Design & Mfg., 503/691-1554. Fabrication: Mike Manion Co., 503/274-9060. Sofa fabric (“Couture Bouclette #4’’/Pale Pewter #9689/01): Glant Textiles Corp., 800/884-5268, glant.com, trade only. Trim on sofa pillows (discontinued): Donghia Furniture/Textiles Ltd., 914/662-2377, donghia.com, trade only. Coffee table (custom): Mike Manion Co., 503/274-9060. Chairs flanking coffee table (discontinued): Wicker Works, 415/970-5400, thewickerworks.com, trade only. Chair-seat cushions (“Campanelle’’/Apricot Monotones and Silvery Gold #5374): Fortuny, 212/753-7153, trade only. Upholstered chairs (custom): Mike Manion Co., 503/274-9060, manioncompany.com. Chair fabric (“Couture Bouclette #4’’/Pale Pewter #9689/01): Glant Textiles Corp., 800/884-5268, glant.com, trade only. Ottoman (discontinued): Wicker Works, 415/970-5400, thewickerworks.com, trade only. Ottoman fabric (“Moire Line’’/Pumice #28697-1616): Kravet, 888/457-2838, kravet.com, trade only. Table between upholstered chairs; chandelier: owner’s collection. Floor-to-ceiling screen between living and dining areas (custom design by Henry Brown): Henry Brown Interiors, 503/274-0966. Rug (white cowhides): S.H. Frank & Co., 415/863-6244. Arm wall sconces: Bedford Brown, 503/227-7755. Art above fireplace (by Fay Jones): The Laura Russo Gallery, 503/226-2754, laurarusso.com. Chests flanking fireplace (custom): Mike Manion Co., 503/274-9060. Zinc capitals on chests: Ed Hardy Antiques, 415/626-6300, edhardysf.com. Chairs in front of fireplace (“Emma Side Chair,’’ in custom finish): Oly, 775/336-2100, olystudio.com, trade only. Available through Bedford Brown, 503/227-7755. Custom finish on “Emma Side Chair’’: by Yvonne Hanks, Yvonne’s Specialty Finishes, 503/201-4758. Fabric on “Emma’’ chair (“Cavallini/Snow Leopard #CS01): Edelman Leather, 800/886-8339, edelmanleather.com, trade only. Windows: Mercer Windows, 888/896-8610, mercerwindows.com. Paint (“Tequila’’ #8672W): Miller Paint Co., 503/233-4491, millerpaint.com. Floor lamps and shades (“Buster’’/polished nickel #2057W): Robert Abbey Inc., 828/322-3480, robertabbey.com, trade only. Table to right of gray sofa (antique): Bedford Brown, 503/227-7755. Drapery (“Somerset’’/Puddle #910038-10); drapery trim (“Somerset’’/Porcelain #910038-01): Rogers & Goffigon, 203/532-8068, trade only. Table lamp (Han Dynasty); shagreen eyeglass (antique, New Guinea): owner’s collection. Mounted circles (bone, antique, New Guinea currency); shagreen collection (contemporary French); rotunda miniature in bone (contemporary); boxes: Bedford Brown, 503/227-7755, bedfordbrown.com. Removing a powder room that bisected the main floor created one large living room. See details on the following slides. Leather chaise (custom): MCF Design & Mfg., 503/691-1554. Leather upholstery (“Venice Camel’’): S.H. Frank & Co., 415/863-6244. Tall candleholders (antique): Bedford Brown, 503/227-7755, bedfordbrown.com. Round table by chaise (antique, Chinese); Asian head sculpture (antique, Thailand): owner’s collection. Table lamp: Wicker Works, 415/970-5400, trade only. Mounted bracelet (antique, African): Bedford Brown, 503/227-7755. The living room’s bar area is defined by an antique French frieze fragment repurposed as a mirror frame. The radial arrangement of four wing chairs creates instant coziness. Wing chairs (custom): Recovering the Northwest, 503/777-0742. Chair fabric (“Somerset’’/Puddle #910038-10): Rogers & Goffigon, 203/532-8068, trade only. 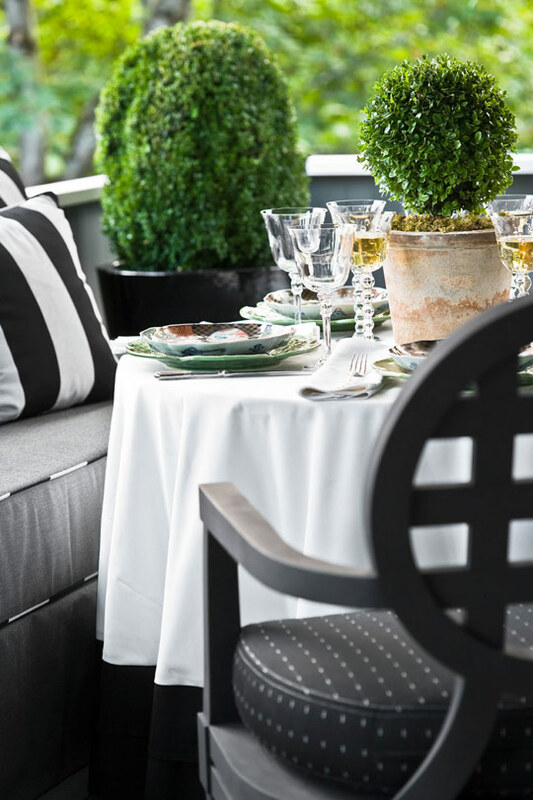 Black-and-white pillows on wing chairs (“Carré Royal’’/Blu #33025/4): Clarence House Inc., 800/803-2850, clarencehouse.com, trade only. Flooring (hand-scraped, pickled white oak): Bentley Wood Flooring, 360/256-7715. Art (by Rick Austin): Mark Woolley Gallery, 503/224-5475. 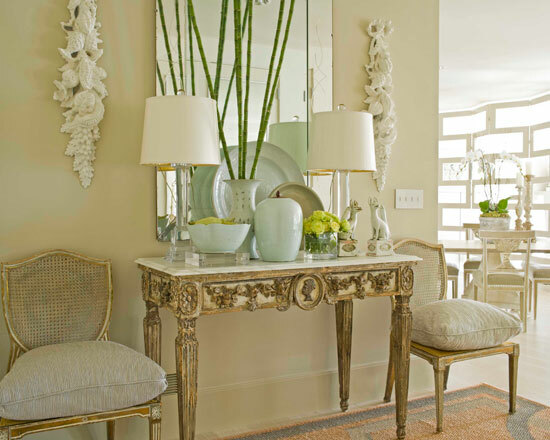 Mirror (custom, antique French frieze); candleholders (antique, Chinese altar sticks): owner’s collection. Mirror fabrication: Don Hartwig, Don Hartwig Custom Framing, 503/526-0845. White jar lamps: Bedford Brown, 503/227-7755, bedfordbrown.com. Windows and doors: Benson Industries, 503/226-7618. Artwork and oddities find a home on an antique Chinese pedestal table. 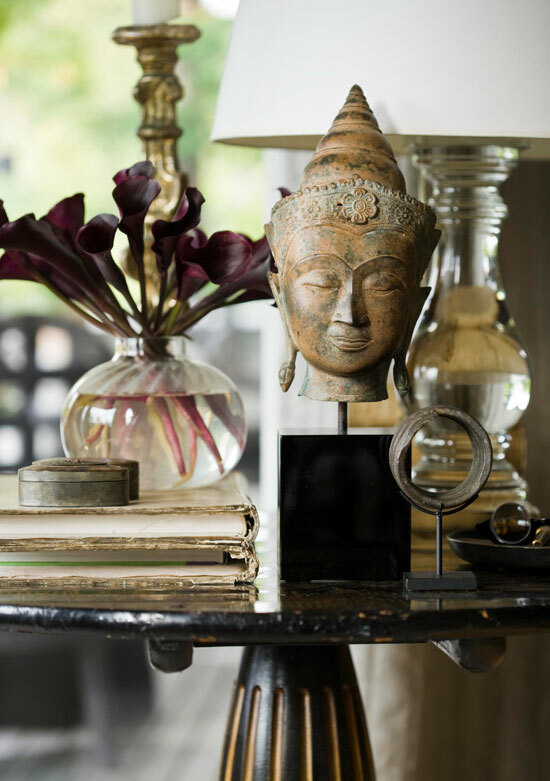 A statue of a head from Thailand lends a dose of zen to the living room. Henry Brown (standing) and Steve Bedford. Zinc 18th-century Portuguese finials are presented as sculpture on stone pedestals in the dining room, where mirrored doors increase the brightness. 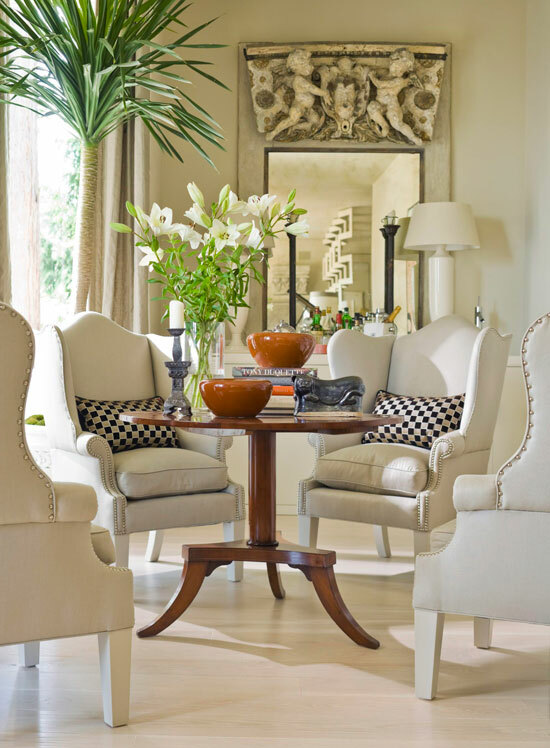 Antique orchid pots and candlesticks adorn an intimate pair of custom tables. The custom open-grid wall permits a peek into the living room, where 19th-century zinc capital molds crown custom chests. Tables (custom design by Henry Brown): through Mike Manion Co., 503/274-9060. Chairs (“Nicholas III,’’ discontinued): Wicker Works, 415/970-5400, thewickerworks.com, trade only. Chair fabric (discontinued): Rogers & Goffigon, 203/532-8068, trade only. Trim (“Venus Gimp’’): Samuel & Sons, 212/704-8000, trade only. Orchid pots (antique) on table with orchids; candlesticks (antique); stone pedestals; architectural pieces on pedestals (18th-century Portuguese, zinc); mirrors: Bedford Brown, 503/227-7755, bedfordbrown.com. Art (by Michele Russo): The Laura Russo Gallery, 503/226-2754, laurarusso.com. Wall paint (“Tequila’’ #8672W): Miller Paint Co., 503/233-4491, millerpaint.com. The hallway’s marble-and-gilt 18th-century Italian table, purchased when I. Magnin closed in San Francisco, is flanked by 18th-century shield-back chairs. The 1930s mirror is French. Table (antique, Italian); side chairs (antique, shield-back chairs): owner’s collection. Side-chair fabric (“Seaton Stripe’’/Salt & Pepper #1161/06): ClassicCloth, 785/434-7200, trade only. Glass lamps on table: Wicker Works, 415/970-5400, thewickerworks.com, trade only. Mirror (vintage, French); contemporary plaster plaques flanking mirror; antique Chinese porcelain on table: Bedford Brown, 503/227-7755. 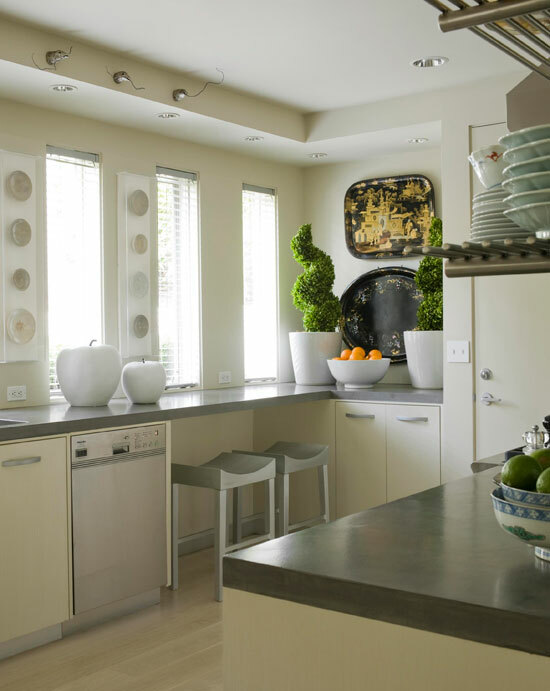 The kitchen’s sleek concrete countertops and linear architecture are softened by a collection of Vietnamese plates on the wall, vintage tole trays, and spiraling topiaries. Dishwasher: Miele Inc., 800/463-0260, miele.com. Refrigerator: Sub-Zero Inc., 800/222-7820, subzero.com. Cabinets (design by Henry Brown): fabricated by Arbuckle Cabinet Shop, 503/659-0765. Cabinet pulls: Chown Hardware, 503/243-6501. Glass jars; pottery; counter stools: Bedford Brown, 503/227-7755, bedfordbrown.com. Art by window (antique Vietnamese plates in plexi boxes): owner’s collection. 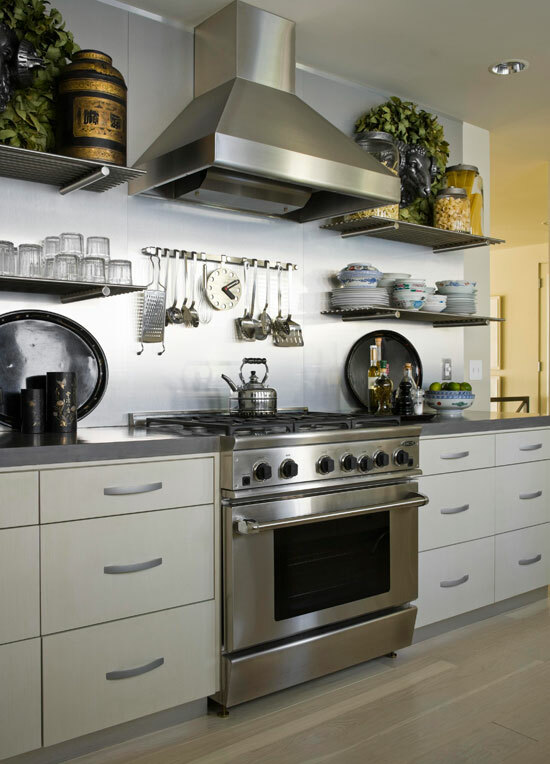 A stainless-steel backsplash brings industrial-style modernity to the stove wall. Range: DCS Appliances, 800/433-8466, dcsappliances.com. Range hood; utensil organizers: Sur La Table, 800/243-0852, surlatable.com. Backsplash wall above stove: stainless steel. The streamlined cabinets designed by Henry receive a subtle dose of richness with a strié finish. Sink: Franke Kitchen Systems Division, 800/626-5771, frankeksd.com. Faucet: KWC Faucets Inc., 888/592-3287, kwcfaucets.com. 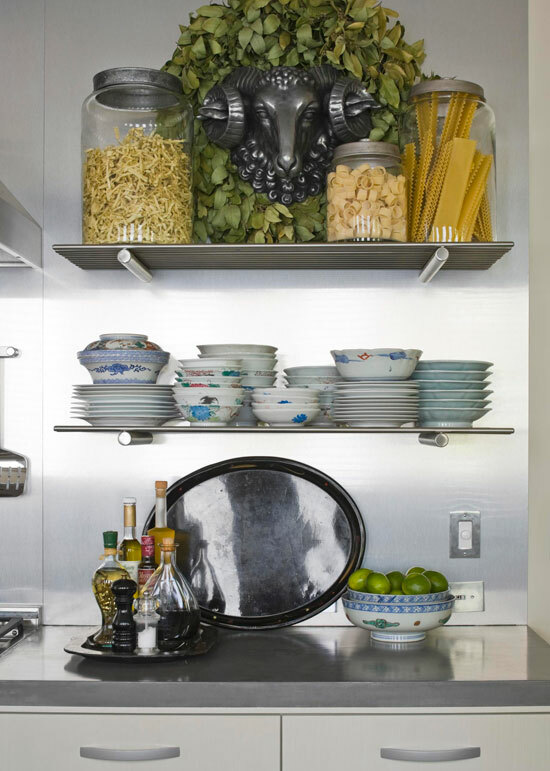 Organization is mandatory with stainless-steel open shelving. A colorful terra-cotta ram oversees all. A pair of old Portland street lamps flank the entry. Lights on stone columns: old Portland street lamps. Paint (“Metal Shavings’’ #8775D): Miller Paint Co., 503/233-4491. The den’s high ceilings allow for dramatic decorating with oversize accessories and art. “High ceilings—anything over 8 feet—create a sense of spaciousness,” designer and homeowner Henry Brown explains. Even when square footage is limited, the lofty altitude will expand breathing room for a more comfortable environment. See more from this room on the following slide. Chair and ottoman: owner’s collection. Asian side table (antique); accessories: Bedford Brown, 503/227-7755, bedfordbrown.com. Pedestal table; armless side chair: Portland Antiques, no longer in business. Art above pedestal table (by Jeff Bertoncino): Udinotti Gallery, 480/946-7056, jeffbertoncino.com. Paint: custom, to match fabric. Desk chair (“Carlyle’’): Wicker Works, 415/970-5400, thewickerworks.com, trade only. Zebra-style area rug: Bedford Brown, 503/227-7755, bedfordbrown.com. An antique Asian side table and curious artwork by Jeff Bertoncino inspire creativity in the den’s sitting area. The den doubles as another guest room that features a daybed plus comfortable seating and bookshelves. 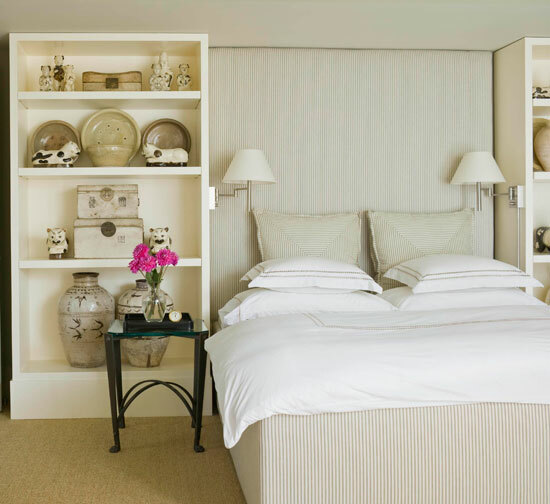 Monkey prints above the daybed add a touch of playfulness to the room’s quiet palette. Daybed (custom): MCF Design & Mfg., 503/691-1554. Daybed fabric; drapery; chair and ottoman fabric (“Drill’’/Leeward #91029-05): Rogers & Goffigon, 203/532-8068, trade only. Monkey prints above daybed: owner’s collection. Floor lamps (bronze): Bedford Brown, 503/227-7755, bedfordbrown.com. Sisal carpet and corals on the window ledge create an organic feel in a guest room. 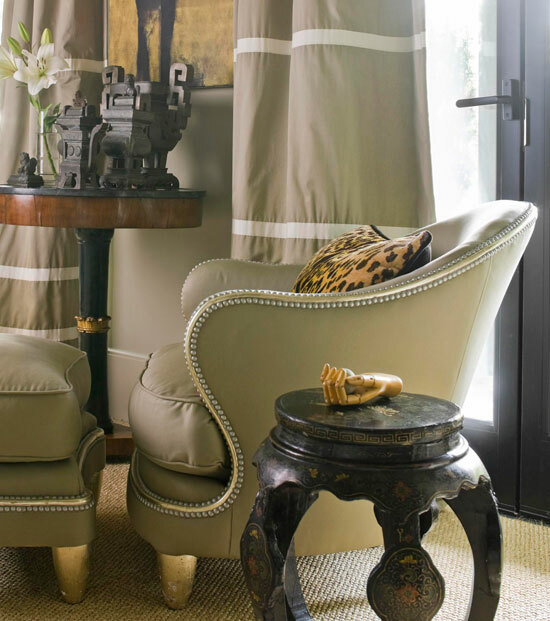 A masculine color scheme creates a subtle yet sophisticated retreat for visitors. Bed (custom): Trio Furniture, 503/233-0799, triofurniture.com. Bedding and shades (“Island Grid’’/Bone #9607-01): Glant Textiles Corp., 800/884-5268, glant.com, trade only. Stools at end of bed (discontinued): Wicker Works, 415/970-5400, thewickerworks.com, trade only. Carpet (sisal, “Tiger Eye’’/Linen): Masland Carpets Inc., 800/633-0468, maslandcarpets.com. Coral; lamps: Bedford Brown, 503/227-7755. Bedside tables (“Mado End Table’’): Donghia Furniture/Textiles Ltd., 914/662-2377, donghia.com, trade only. Photographs (by Ron van Dongen): Elizabeth Leach Gallery, 503/224-0521. Paint (“Simply White’’ #2143-70): Benjamin Moore & Co., 888/236-6667. Natural light flows freely through the bathroom, where marble and glass combine to create an indulgent spa-like atmosphere. The shower features a glass wall, which provides breathtaking views of their stunningly serene Oregon setting. The symmetrically composed master bedrooms features twin swing-arm sconces for bedtime reading and a tall, upholstered headboard. Upholstered bed: MCF Design & Mfg., 503/691-1554. Drapery and bed upholstery (“Montana’’/Mole #910017/02; discontinued): Rogers & Goffigon, 203/532-8068, trade only. Bedding: French Quarter Linens, 888/200-7498, frenchquarterlinens.com. Marble-topped chest (antique); art to left of chest (pen and ink drawings by Rick Potestio); mirror (antique); box (antique English sewing box); dahlias in vases on black trays: owner’s collection. Lamp on chest: Wicker Works, 415/970-5400, trade only. Blackamoor figure; Chinese black jars; stone pedestal table: Bedford Brown, 503/227-7755. Chairs (antique, Klismos-style): Ed Hardy Antiques, 415/626-6300, edhardysf.com. Chair fabric (discontinued): Clarence House Inc., 800/803-2850, clarencehouse.com, trade only. White armoire (custom): Mike Manion Co., 503/274-9060, manioncompany.com. Iron bedside tables (“Vesuvius’’; discontinued): Donghia Furniture/Textiles Ltd., 914/662-2377, donghia.com, trade only. 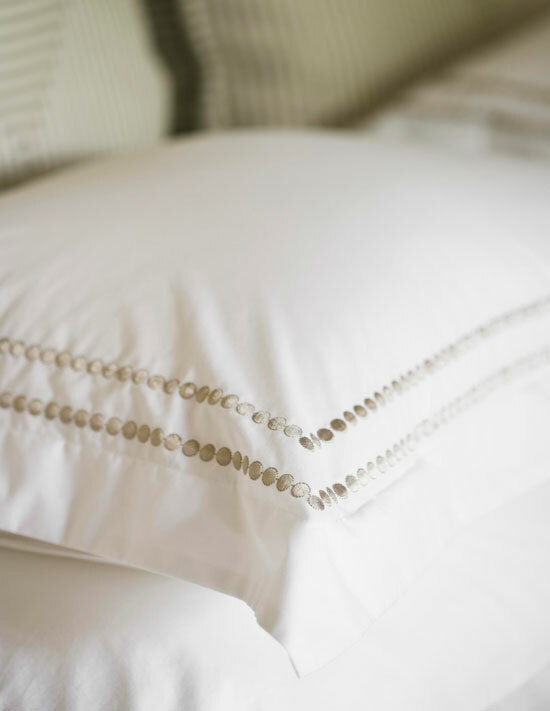 Soft details lend subtle elegance on the plush bedding from French Quarter Linens. 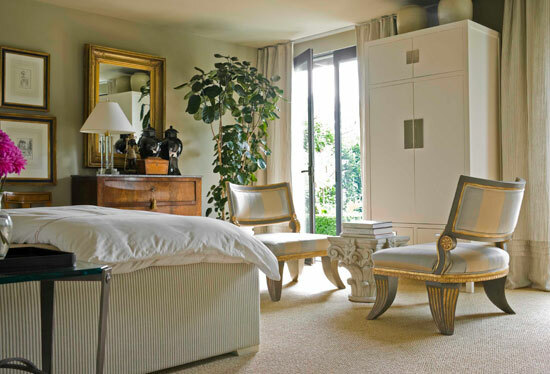 A pair of Klismos-style antique chairs adds character to the master bedroom. This home’s rich design doesn’t stop here. Henry and Steve’s sophisticated style continues into their backyard, which boasts a gorgeous outdoor living room.